Alma Huffman was a loving and dedicated wife, mother, sister, grandmother, great-grandmother, and a loyal friend to all who knew her. She lived her life in a simple manner, doing her very best for her children over the years. A huge Detroit Tigers fan, she took stats on nearly every game and if she wasn’t able to watch the game live, she’d find every measure to secure a replay of what she missed! Despite her passion for baseball, it was clear that her family was her greatest treasure and each and every person was made to feel special in her presence. Alma leaves behind a rich legacy of a servant’s heart for all who knew and loved her. Despite the Thirties being marked by tough economic times, the decade also saw an expansion of new technologies, especially in the areas of radio and film. In 1933 for example, five-year-old Shirley Temple signed a contract with Fox and the original King Kong movie was released. Bringing great joy to their world, Francis and Laura (Maynard) Balsitis welcomed home their daughter, Alma May on June 9, 1933, in Grand Rapids, Michigan. Born the third of seven children, her parents were overjoyed with her birth and raised her with a strong foundation of faith. 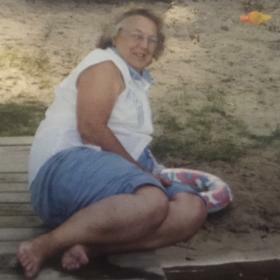 Growing up primarily on the west side of Grand Rapids, Alma worked hard to help support the family’s growing needs. She left school at an early age as she was often the one to help care for her younger siblings. Later, she began work at the Woolworth’s downtown. Responsible and caring, she was always looking for ways to support not only her family but many others in need. 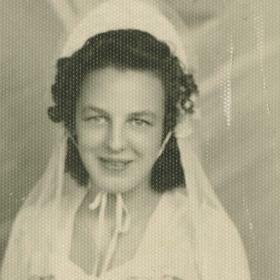 She found great satisfaction from serving others, a gift that lasted throughout her lifetime. She met the man of her dreams, James “Harry” Huffman during this time and after dating for merely three months, they joined in marriage. Harry was the perfect match for her as they both desired to enjoy the simple pleasures of life and raise a family. Starting out in Grand Rapids, they welcomed their children, Laura and Harry before they moved to Jefferson City, Missouri. During their four years there, their family was completed with the arrival of Robert and Patrick. Missing their relatives in Michigan, they returned and settled in Bailey just north of Grand Rapids. Alma was a remarkable mother. She juggled raising her family while also working full time with Lescoa, an auto parts manufacturing plant, for more than forty-two years! With a busy schedule of attending sporting events, managing dinner, as well as working, the chores were left to the weekends. Never owning her own washer or dryer, Alma spent countless trips to the laundromat. These days never tampered with her strong desire to take the children roller skating or packing up for a vacation to the backwaters of Tippy Dam on the Pine River. As a family, they enjoyed tent camping, pumping their own water and using outhouses. These rich memories shaped their close-knit bond with one another. Supportive of her children, they never doubted her love for each of them as she was willing to give her all to share in their successes. As the children grew, Alma attended church regularly. Her favorite part of worship was singing along to traditional hymns. Most weekends, the she and Harry shared a passion for attending races at the Berlin Raceway in Marne, Michigan. Sadly, Harry passed away unexpectedly and Alma was left to manage as best she could. She leaned on her family and spent quality time with them. For a short time, she moved to the Baldwin area to be closer to one of her sons. Here, she fell in love with her new church home the Lake Community Bible Church. A natural nurturer, she loved to volunteer many summers she helped with the church’s summer day camps. The children were drawn to her warm smiles and gentle ways. 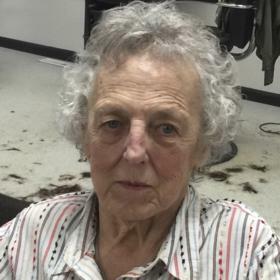 She also relished in her time spent with her many grandchildren and took every opportunity to attend their special events and school programs over the years. As Alma began to age, she needed additional help. Daughter, Laura and son-in-law Charlie, purchased a home two blocks from theirs in Fruitport for Alma to reside with granddaughter Tracy and great-granddaughter Taylor. 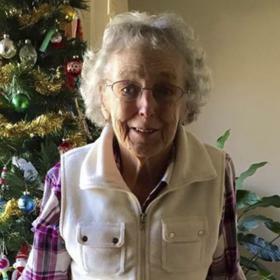 She continued her desire to read Christian Romance novels, watch her favorite game shows, cheer on the Detroit Lions, and on occasion kept up with popular daytime Soap Operas. She also enjoyed completing puzzles and sharing in the company of those who came to visit. 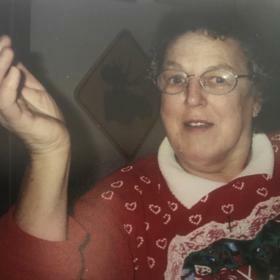 She was also a member of First Congregational Church of Fruitport. After suffering an injury, Alma moved to Covenant Village of the Great Lakes where she received the very best of care. Quick-witted and positive, she was a favorite among the staff! Alma leaves behind a wonderful legacy of being exceptionally loving and compassionate. May her loved ones find great comfort in knowing that they were loved beyond measure. There is no doubt that her presence among them will be deeply missed and fondly remembered.